We strive to be an Always Better Business that is profitable, sustainable and a great place to work. We do it by focusing on continuous improvement in our operations and supply chain, in partnership with our employees and suppliers. Our goal is to ensure sustainable growth through local production, so contributing to the communities where we operate. 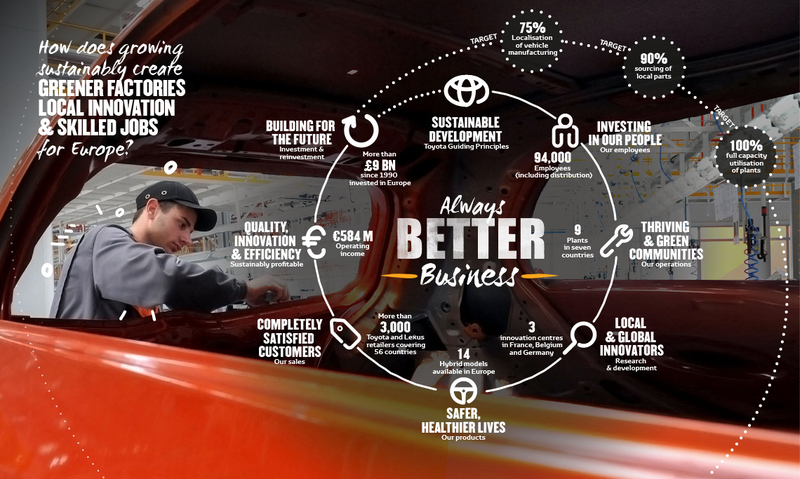 At Toyota, we aim to be a successful business that works in a sustainable way and contributes with local production and employment to the communities where it operates. We believe that harnessing the potential of our talents is what will make us successful and will allow us to achieve a model for sustainable growth that will contribute to the European economy. Car-makers in Europe today are confronting some of the biggest business challenges any company can face. A saturated market, intense competition from an increasing number of rivals, and political uncertainty are just a few of the main issues car manufacturers must deal with. At the same time, companies must meet the demand for transparent and responsible supply chains, greener operations, and greater local production and community development. At Toyota we thrive on business challenges, using them as an opportunity to innovate and improve our business. We believe that as a business our first and foremost contribution to society is the wealth and employment we create in our host communities, and the development of people that directly and indirectly work with us. Not only are we committed to keeping our operations in Europe – we are actually increasing the number of models produced in the region, as well as the responsibility of our European operations in vehicle development. After four years of profits, thanks to many activities aimed at offering the best products to our customers but also many efforts to reduce costs and reorganise production, we are now on track towards sustainable growth. In 2015 our operating income totalled 584 million euros and we increased our hybrid mix to 24%. These very positive results have been possible thanks to our continuous commitment to improve our operations and the very good results of our locally-produced hybrids, especially the French-produced Yaris and the British-made Auris. Toyota Motor Europe is also taking increasingly responsibility for local production and model development. With 9 manufacturing plants producing vehicles, transmission and engines, in the last year we covered 70% of European demand for Toyota vehicles and exported to more than 40 countries. Also, last year, TME led the simultaneous development of two model changes, taking charge of the Avensis and Auris. The dual start of production of the new models was successfully completed under the UK plant in Burnaston. The increased demand for locally-produced models also allowed us to increase our contribution to employment and skill development in Europe. Thanks to an increasingly stable base of business, we are developing a solid foundation for sustainable growth that will allow us to weather crisis and lay the basis for a sustained level of employment in Europe. Our sustainable journey to Always Better Business is a continuous process of improvement, where we commit to achieving the maximum in terms of quality, innovation, cost reduction and outstanding products. We believe that this could not be possible without our most important asset - our people. For this reason we continue to invest in talent development at all levels, through classroom training and on-the-job-development. We are convinced this will allow us to achieve our goal to make Always Better Business in a sustainable way. By investing in European production, localised R&D, green operations and local talent development, we make vehicles that our customers love, which enables sustainable growth and reinvestment in our local communities. Through mutual support, open communication and sharing of best practices, we are making sure that our suppliers can deliver at the highest level and remain competitive. Toyota’s European Association of Manufacturers (TEAM) is a group of Toyota suppliers who work together and strive to improve their performance through mutual support, open communication and sharing ideas and techniques. TEAM is one of 12 Toyota supplier associations that exist globally, and the only one based with a regional basis. Supported by TME Purchasing, TEAM is made up of 70 long-term business partners organised in 10 groups spread across three regions (UK, Turkey, and Central Europe). These 10 groups meet at a core group level every month to focus on practical shop-floor improvement, rotating around each company location. Twice a year, all companies meet for an Annual Review and Interim Review Meeting (ARM/IRM). Every company follows an annual improvement project using the Toyota Business Practice approach to problem solving. During the monthly meetings, the companies hold an improvement workshop focused on practical Kaizen, or real shop-floor problem solving. In addition, we would like our Suppliers and Business Partners to gain full understanding of our expectations towards sustainable development & good corporate citizenship, to assure legal compliance at all times. This is why since 2002 we have created the Sustainable Purchasing Guidelines which help TME support our suppliers to meet global Toyota expectations in a fast moving regulatory environment covering subjects as diverse as chemical management (REACH etc.) to Corporate Social Responsibility (CSR). Through commitment to all business activities, such as styling, development and production, we support the European economy and employment. Toyota Motor Europe has a long tradition of supporting local production, creating wealth and employment, and developing skills in our communities. We are committed to the European region through our manufacturing, R&D and design operations, with 9 manufacturing sites across Europe and 3 innovation centres in France, Germany and Belgium. Employees Toyota’s philosophy regarding its employees, who support its stable base of business, has been systematically organized as the Personnel and Labor Toyota Way Respect for Human Rights Our founding principles and policy contain the concept of respecting and honoring the human rights and other rights of all the people involved in Toyota's business Collaboration with Business Partners In order to contribute to society through our business, we need to work with our business partners in a spirit of cooperation Story of Supra From a starring role in the first Fast and the Furious movie to the choice of wheels for gamers in Gran Turismo®, the Supra has cemented its place in popular culture and inspired young and old around the world. The 13th Toyota Dream Car Contest - Winners 2019 As Toyota, we believe that dreams can take you anywhere, wherever you are. So how would your fantasy automobile make the world a better place? During the 9th Cyprus Toyota Dream Car Art Contest, we received more than 900 entries in total. We proudly present you our 9 winners!! Toyota Protect There’s nothing like the showroom gleam of a brand new car. Toyota ProTect is a revolutionary new NASA-derived coating which provides high-grade protection for vehicle surfaces, and is now available at Dickran Ouzounian & Co Ltd Dakar 2019: Victory! Toyota GAZOO Racing SA’s Nasser Al Attiyah and Mathieu Baumel bring home their South African-built Toyota Hilux for an historic victory. Toyota Accessories Package Offer Your Toyota is always special! Whether new or used. Renew it with the most essential accessories pack, which you can find at a special price.